Ropes courses are incredibly popular these days, and for good reason. They are a wonderful tool for team building, confidence boosting, and having fun! 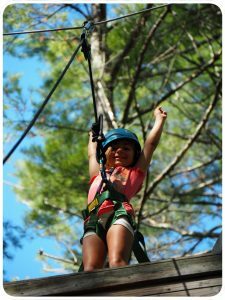 Camp Quinebarge was among the first traditional summer camps with a ropes course in the late 1990’s, and since then, the high and low courses have been one of our most popular activities. Our courses and climbing tower were fully renovated in 2015, and are inspected and maintained annually to meet ACCT (Association for Challenge Course Technology) standards. 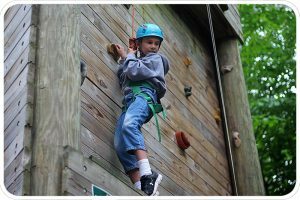 Our Ropes and Climbing program, known as Adventure, is a perennial favorite here at Camp Quinebarge. Over the course of a week, campers go through on-the-ground team building, work their way through our low ropes course, and finally move on to our high ropes course and zipline. Our low course consists of elements that are one to three feet off the ground, including log walks, the “Low-Y”, Spider Web, Nitro Swing, Giant’s Finger, Mohawk Walk, trust fall, and our 10-foot wall. Groups use teamwork and communication to complete each challenge, and bond as they do so. 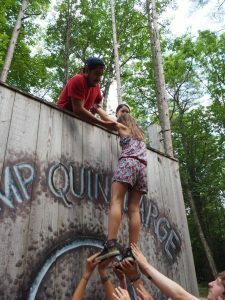 We train our counselors annually for our specific course, and counselors climb into the course to assist campers as needed. Every camper who attends Quinebarge goes home with new friendships. Completing our Adventure program with cabinmates or friends greatly enhances those friendships. We design our warm ups and low ropes obstacles to do more than just challenge them physically. Our program encourages them to cooperate, work as a team, communicate, and trust one another. By the end of the program, groups have bonded over the shared experience, forming a solid foundation for lifelong friendships.